Prue is not entirely sure what is going on, but she knows one thing for sure. Her brother was abducted by crows, brought to the Impassable Wilderness and she has to get him back. She also, can not let her parents know that he is missing. Of course a rescue mission into the forest is not an easy task, but luckily Prue has help whether she wants it or not. Curtis sees Prue sneaking out into the woods and decides to follow her. They've both heard terrible stories about the fate that awaits those who dare enter the Wilderness, but they are not at all prepared for what they find there. Before they hardly even get inside, they are separated and both have to find a way back together to find Prue's brother. So I'm not entirely sure this can really be considered a Middle Grade novel. I mean, it has a certain quirkiness like The Mysterious Benedict Society and The Incorrigible Children of Ashton Place, but some things just don't work. One thing that I didn't love was the vocabulary. So many words I had never seen before, it seemed like someone had too much fun with a thesaurus. I mean vacillating, I have never seen that word, and I'm a pretty avid reader, so... Another thing, is it seemed a little too Portland-y for me. Clearly not all people are like that, but it had this sort of hipster quirk to it that I was just like, huh? Prue acts like a weird thrift store loving adult more so than a young girl. It just didn't really work with me especially on top of the vocabulary. Also, why is this story so dang long? I feel like there were a lot of things that were just put in to beef the book up. At times, it was a bit boring. The story itself was interesting and adventurous, but entirely too long. I don't mind long novels, but I need enough story instead of just filler pages. I did love the illustration. Carson Ellis also illustrates the Mysterious Benedict Society and Lemony Snicket books. They are just really great. I was a bit surprised how much I did enjoy the story. Animals that can talk sometimes put me off, especially if they don't all talk. Like the horses in Wildwood didn't talk, but were ridden around, where as most of the other creatures did. 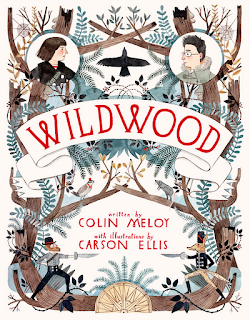 If you want to give this one a try definitely do, but I can't say that I would recommend this to Middle Grade readers, just because it seems to be written more for quirky adults. "How five crows managed to lift a twenty-pound baby boy into the air was beyond Prue, but that was certainly the least of her worries." "As she walked, she breathed a quick benediction to the patron saint of sleuthing. 'Nancy Drew,' she whispered, ' be with me now.'"